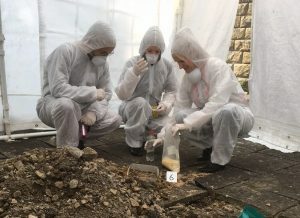 “WELLCOME” TO FORENSICS – is a six week programme with one three hour session per week from 1st March 2019. It is free for members of the public and is funded through the Wellcome Trust and WEA. We believe, and we think you will agree, this is going to be a one off chance to have fun and do something really interesting. This is an event for adults and there are no requirements as to quaflications or ability, even if you have never studied before you are more than welcome to join us. There is definitely no need for any forensic knowledge. Funding is already available and you do not need to make any applications or complete any paperwork to obtain it. Just contact us to register your interest and enroll in the course. The programme will be take place at Enderby Civic Centre, King Street, Enderby, Leicester LE19 4NT however the final session we will include a visit to Think Forensic’s dedicated Crime Scene Centre in Skelmanthorpe, Huddersfield (transport provided). Each session will run from 10am to 1pm. If you do want to enroll you must be prepared to make your own way to the Civic Centre each week and must sign up to all six sessions. 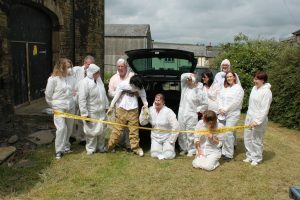 The sessions will be run by Think Forensic’s own staff so you will meet and talk to Forensic scientists, CSI’s, senior investigating officers and crime investigation officers all of whom have worked in the field. Each week we will look at a different topic and we have put a basic outline of the programme below, however we may change this depending on our staff availability. Opening of course, information on WEA and Wellcome Trust followed by introduction to forensics – different branches of forensics, roles, difference between CSI and forensic scientist, types of evidence, case study highlighting team working, budgets and evidence integrity. Fingerprints – developing, lifting, identification and the biology behind prints. Blood Spatter – velocity, direction of travel, weapons, reading patterns. 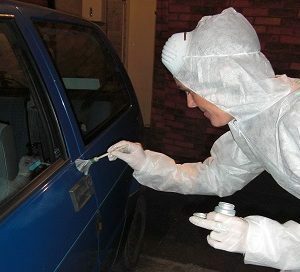 After meeting at Enderby the group will be taken by coach to Think Forensics unique Crime Centre where you will be tasked with processing crime scenes including identifying, recording, collecting and packaging evidence authentically. Liaising between teams with radios to pass on relevant information – once scenes are processed you will analyse collected evidence and decide on courses of action and investigation to solve the crime. If you would like more information contact us on 01484 860 599 or email us at hello@thinkforensic.co.uk alternatively you can register your interest in attending the event by clicking here once you’ve done that we will be in touch to let you know if you have been successful.